When it comes to spice racks, the typical offerings at Bed, Bath & Beyond or Crate & Barrel just don't do it for me. But the Soho Spice Rack does. It meets my two big criteria for a spice rack: 1) it's got to look good. 2) it's got to work. By "work" I mean, I have to be able to see all the spices at a glance, they have to be in easy reach, but they can't be in the way. If you break it down that was actually four criteria, not two (notice No. 2 actually had three parts?). 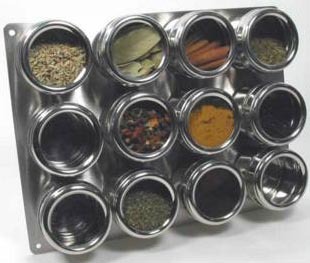 However you count them, the Soho Spice rack meets them all. Looks wise, it's got nice big round windows to show off my colorful spices, and stainless steel will never go out of style in a kitchen if used with restraint. Those big round windows also let me see all my spices in one shot. And the canisters are magnetic and attach to a flat sheet of stainless steel (included, as are the screws), so they are easy to mount in a convenient location. Because the canisters are wide and flat, they have a low profile, so they more or less hang on the wall out of the way until you need them. Hang on the wall like art, I should add. The good looks and cool design will cost you, though. The 20 canister mega rack goes for around $200. The lowest I've seen the 5 canister rack is $29. There is one problem I've run into. About four (out of 36) of my canisters have detached from their magnetic base and fallen down. However, there was no damage done and a little glue fixed them up straightaway. Turns out they are quite sturdy. It's a product shot, not something I took. I see no labels on these jars. So do you have to remember the latitude and longitude of the ground ginger so you don't spice your pie with its lookalike, garlic powder? There are labels that wrap around the sides of the canisters. I don't use them because I pretty much know what's where, but if you look at the Soho Spices Web site you can see what they look like. If you live in on near beautiful Brooklyn, NY, you can get these spice racks at Yu Interiors at 15 Greene Avenue in the oh-so-hip Fort Greene section. If memory serves, they are *much* cheaper there than the prices quoted here. I have a 20-canister rack and I don't think it set me back anything like $200. I just found the 20 canister set on ebay, brand new for $110. Thank you for your comments, I am a great fan of spices and spice rack have always been tricky to me ! I have exactly the same criteria as you do so I feel a little less lonely about my search of the "perfect Spice Rack". But I have found the one, meeting all our wishes (it seems to me we have the same). I found it online at www.lepicerie.com . You have to click on the little picture if you want a better look of it because when it is too tiny, it doesn't do it any justice ! I have taken the #2, I think it is fabulous. And it is actually not too bad pricewise: $35 for ten spices if I can remember. Hi! I have 2 12 canister sets but they didn't come with labels. Do you know where I can purchase these? Thx! Had them for more than two years and use them daily. I had exactly the same problem with the canisters falling off the magnetic bases (probably due to the heat in the kitchen in summer). Also glued them back and worked perfectly. Ground cloves made the plastic lid foggy permanently, but Soho Spices sent us an extra lid. We could pass without the small holes in the canisters. Love how they are helping me to learn the spices.